With November making its way in 2018, gaming and leisure experiences should be taken full advantage of. Making the most out of your gaming experience is utmost possible at w88. 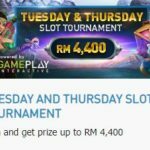 Malaysia’s number one online game operator gives its members a superb selection of promotions, rebates, and cashbacks. 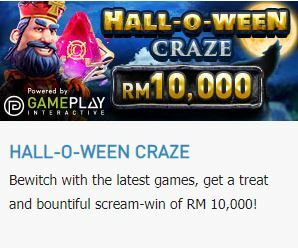 Welcome November with two great slots promotions this Halloween season and get a chance to earn as much as RM 10,000 to the total pool prize of RM 223,000. 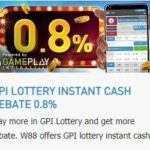 W88 slots are always coming up with ways to give its players a selection of new games that make betting on slots a fun interactive gaming experience. This promotion starts from: 22 October 2018 00:00:00 (GMT+8) until 31 October 2018 23:59:59 (GMT+8). Qualifying games for the tournament are: ALCHEMIST’S SPELL, TRICK OR TREAT, SWEET TREATS, and CHESS ROYALE. Minimum qualifying bet per spin is: RM 4 to qualify for 1 point. Minimum 25 points to be eligible for the prize. Top 25 players with the highest points will receive the prize based on their rank on the leaderboard. Bonus, free spins; instant win, features games and double-up do not qualify in the tournament. General Terms & Conditions (T&C) and Rules apply. 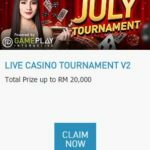 PP MONEY RACE – Win the prize pool of RM 233,000! 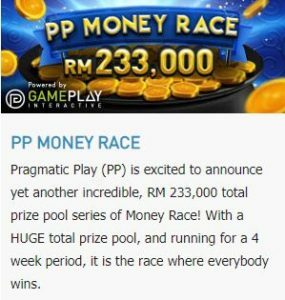 Pragmatic Play (PP) is excited to announce yet another incredible, RM 233,000 total prize pool series of Money Race! With a HUGE total prize pool, and running for a 4 week period, it is the race where everybody wins. Winner list will be announced on every Monday at 14:00 GMT+8 by Pragmatic Play. If there are two or more players with identical win score, the player who scores it first will get the higher position on the leaderboard. Scores updates automatically and can be viewed on the leaderboard. On the leaderboard, you will see your progress listed as “you” and only other players’ Tournament IDs. PP reserves the right to amend, suspend or cancel the promotion at any time. Money Race starts from 10/18/2018 12:00 (noon) – 10/22/2018 12:00 (noon) GMT+8. Money Race winners are based on score ranking. 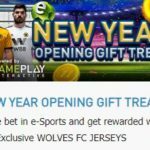 Score = Highest single winning amount of a spin/ Bet amount x 1000 (WIN/BET x 1000 = Score). 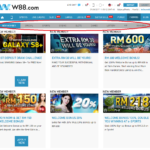 Minimum qualifying bet per round is RM 1.2. Qualifying games for the Race are Master Chen’ Fortune; Peking Luck; Caishen’s Gold; 888 Dragons; Monkey Madness; Wolf Gold both on mobile and web. 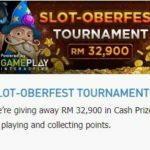 Top 200 Players with the highest score will share RM 39,500 Prize Pool. Money Race starts from 10/25/2018 12:00 (noon) – 10/29/2018 12:00 (noon) GMT+8. 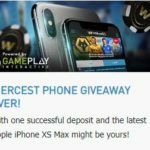 Score = Sum of all winning amount during promotion which is converted in USD x 1000. No minimum bet is required during the Race. Qualifying game for the tournament is all Pragmatic Play Games except for 888 Gold, Diamonds are Forever 3 Lines, Irish Charms, Money Roll, Queen of Gold, Table Games, Video Poker and Other Games both on mobile and web. 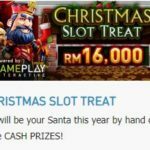 Top 200 Players with the highest score will share RM 51,500 Prize Pool. 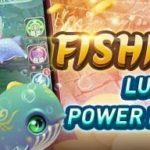 Money Race starts from 11/01/2018 12:00 (noon) – 11/05/2018 12:00 (noon) GMT+8. 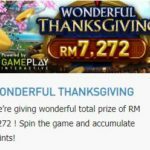 Top 200 Players with the highest score will share RM 58,700 Prize Pool.